The 4017 IC is a truly useful IC in project works, timer based games and in various DOCTRONICS construction kit like Light Chaser and Matrix Die. It’s having lots of useful application if we think, you can check all our 4017 IC related projects here. If we talk about the technical part, it’s a CMOS decade counter decoder circuit. This IC is used to generate output in a sequence manner like it start from zero and goes up to 10. It shifts it output from one pin to another by applying clock pulse at PIN 14. First clock pulse makes first output PIN (PIN 3) HIGH, second clock pulse makes first PIN LOW and second PIN (PIN 2) HIGH, third clock pulse makes third PIN HIGH, and so on. So it creates sequential ON and OFF of all the 10 OUTPUT PINs which is needed in our LED Roulette circuit. 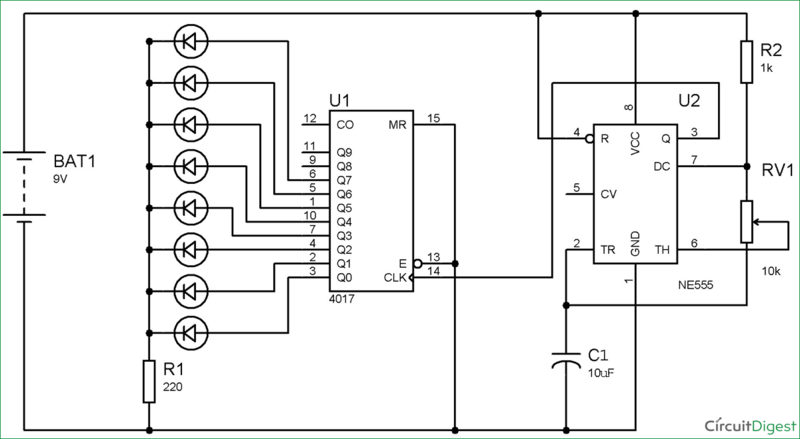 Here this clock pulse is generated by 555 Timer IC in astable mode. Used to cascade another 4017 IC to makes it count upto 20, it is divide by 10 output PIN, we can count how much we want just by cascading the ICs through this pin and every IC will generate 10 outputs. In operating condition this pin will remain at Low, beacause if this pin is High, will stop the pulse generation means it will be in freeze mode. what is the practical application and key idea of this circuit?